Fly the flag. The headlines will be about the solid milestone. The UK finally replanted its flag on its 2008 GDP growth peak, three years after Germany and the United States reclaimed theirs and after a mere five years of ultra-low interest rates. But the landscape – the details of the second-quarter GDP – has its uncomfortably rocky side. The Bank of England’s Monetary Policy Committee will see some grounds for concern. The 0.8 percent growth from the first quarter was generated almost entirely by the dominant services sector, which sprinted up by 1 percent. The rate of growth of industrial production slipped from 0.7 percent in the first quarter to 0.4 percent – equivalent to a meagre annualised rate of just 1.6 percent. Construction output contracted by 0.5 percent, bad news in a country needing houses. The UK’s ascent, as in the past, is a straggling one, with services showing signs of leaving industry and manufacturing lagging behind. The UK’s close-to-record external current account deficit of over 4 percent of GDP is more evidence of that. Weak international competitiveness still looks like a big British growth-inhibiting problem, not helped by the fast recent rise in the pound. The risks of a British slowdown reflect a wider trend. The Bundesbank believes German second-quarter GDP stagnated, and the International Monetary fund just cut its expected global growth rate for the year, with emerging markets less strong than before. Weak Europe and a slow-growing world are tough on UK exports. Services might keep the UK climbing. But here, too, there are dangers. With wages up only an annual 0.3 percent in the three months to May, Britons are still not able to spend freely, even if more of them have jobs. Some MPC members have recently been edging closer to endorsing an increase in rates soon. But the committee will watch closely for further signs of weakness in industry and wages. The pound may ease back from its $1.70 heights. The British economy is back to its peak. Storming on beyond it will get harder. 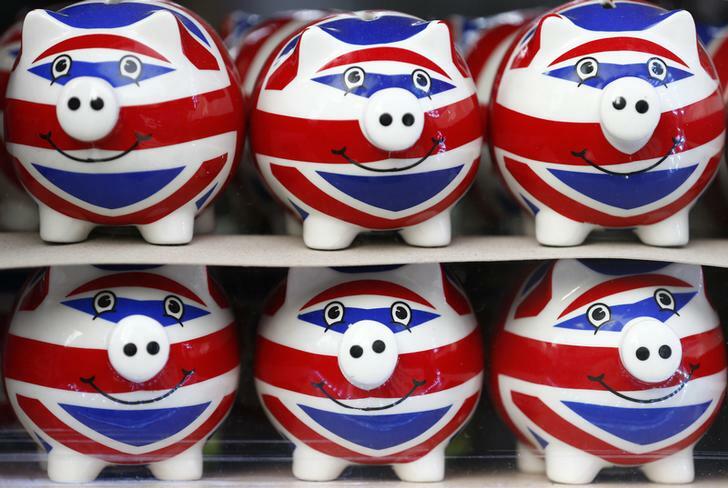 Smiling Union Jack piggy banks are lined up for sale in the window of a souvenir store on Oxford Street in central London January 20, 2014. The Office for National Statistics reported that the UK’s real GDP rose by 0.8 percent in the second quarter of 2014, maintaining the pace of growth seen in the first quarter. Output increased by 1 percent in services and by 0.4 percent in industry. It decreased by 0.5 percent in construction and by 0.2 percent in agriculture. GDP was 3.1 percent higher compared with the same quarter a year ago. The rise lifted the UK’s GDP to a level 0.2 percent above its previous peak in the first quarter of 2008. From peak to trough in 2009, the economy shrank by 7.2 percent.